Large or Small… We Fit Them All! The Dogsie Dog Shirt is a snug fitting light-weight cotton body shirt for dogs, with a sewn-in absorbent lining with a waterproof backing to keep any accidents that may occur while wearing the shirt contained to the shirt. The shirts are fully washable. Because the shirt fits snugly, the only time the dog can comfortably go to the bathroom is when you take the shirt off and send them outside. While inside, the shirt encourages the dog to hold it, developing muscle control. Perfect for dogs who like to mark their territory. This shirt is also very effective for females during the heat cycle, not only absorbing discharge, but making it impossible for her to be bred while wearing the shirt. For adult dogs who mark territory, they are not able to lay scent in the home, therefore they mark less. For older dogs who have become incontinent, they won’t be soiling the house and can still spend time with their family. If you would like to take your dog visiting with you, but worry that your dog may have an accident or mark territory in someone else’s home, just have your dog wear the shirt while visiting. 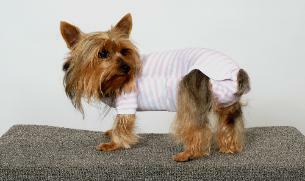 The shirt slips on over the dogs head, with sleeves for the front legs, and then comes between the dogs back legs and snaps on top of the back at either side of the tail. 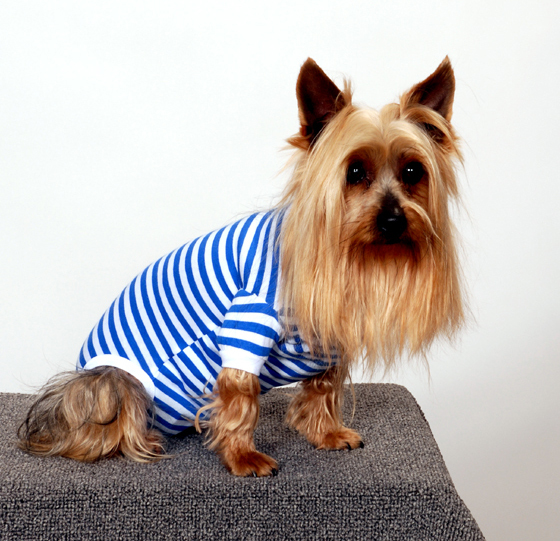 Our Dogsie Dog Shirts are fully washable. Email us at pegago131@gmail.com or call 502-348-1219. We are here to answer any questions you may have about our Dogsie products.